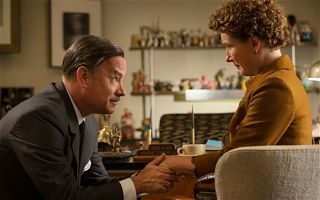 Like Mary Poppins herself, “Saving Mr. Banks” is “practically perfect in every way”. Emma Thompson as Poppins author P.L. Travers and Tom Hanks as the legendary Walt Disney lead an outstanding cast in director John Lee Hancock’s cinematic masterpiece, that’s more than just a “Making of” film. “Banks” captures the sadness and love, the joy and the pain it took to turn a popular children’s book series into one of the most beloved movie musicals of all-time. There is so much love and care poured, by the spoonful, into every scene. It’s a sweet, heart-tugging movie that’s destined, like the film it inspires, to become a classic. Director Gabriela Cowperthwaite examines the use of incredible killer whales in theme park shows, and the history of negative results, using amazing, unseen footage of actual, life-and-death events, along with TV news accounts and raw, compelling interviews with former SeaWorld trainers and others forever effected by this practice of capturing these creatures and turning them into entertainers. “Blackfish” is an intense, shocking, important, emotional and completely mesmerizing documentary. Disney’s best animated musical since “Beauty and the Beast” is inspired by the fairy tale, The Snow Queen. Not only are the musical numbers fantastic, but the animation is phenomenal and the script isn’t as simple as you might think. Josh Gad’s Olaf the snowman is a modern animation classic character. “Frozen” is a sweeping epic adventure, packed with romance, suspense, comedy and drama. In short: A crowning achievement. Beautifully shot in black in white by Alexander Payne, this is one of the most intricate and engaging narratives of the year. Bruce Dern gives a rich performance as a man of few words, but unforgettable emotional control. He and Will Forte provide some of the most heartfelt on-screen moments of the year. “Nebraska” is not only a ‘father-son’ story, but a commentary about life, dreams, and missed opportunities. This is a moving, heartbreaking, and inspiring historical drama masterfully directed by Steve McQueen. “12 Years a Slave” captures your emotions from the start and never waivers for the entire 2+ hours. I was thoroughly invested in free man turned slave Solomon Northup’s struggle to survive. The ensemble cast is a powerhouse, led by the fantastic Chiwetel Ejiofor. Lupita Nyong’o and Michael Fassbender are equally strong. Directed by David O. Russell (“Silver Linings Playbook”), this is a smart, chic, sophisticated con-caper that’s hugely entertaining. Amy Adams gives the best performance of her career, and Jennifer Lawrence is a shoe-in for another Academy Award nomination and could actually win again. Even THE Robert De Niro makes an uncredited cameo. O. Russell has once again made a fun, challenging movie from the first to the final frame. The late James Gandolfini shines in this delightful romantic comedy. His chemistry with Julia Louis-Dreyfus is completely natural and magical. The final ten minutes include some of the best scenes of the year. J.J. Abrams’ Starship Enterprise sequel is just over two hours of non-stop action, drama, suspense and laughs, drawing pure emotion out of every character and situation. There’s nothing more you could possibly want out of a popcorn movie. Judi Dench gives a golden performance in this true story of a woman who wants to find the son who she gave up for adoption 50 years ago. Steve Coogan plays a journalist who goes on this quest with Philomena. Coogan also co-wrote the sharp, deep, believable screenplay that doesn’t pull any punches. Chadwick Boseman is excellent as legendary baseball player Jackie Robinson, and Harrison Ford gives one of his best performances as Brooklyn Dodgers General Manager Branch Rickey. Writer-Director Brian Helgehand doesn’t hold back in showing the abuse that Robinson was forced to endure in this effective, authentic sports drama with a simplistic yet celebratory treatment. “DALLAS BUYERS CLUB” – Matthew McConaughey and Jared Leto shine in an inspiring, emotionally powerful drama. “DESPICABLE ME 2” – Two words: More Minions! “GRAVITY” – Sandra Bullock and George Clooney soar in space under visionary director Alfonso Cuaron. “THE SAPPHIRES” – Pure entertainment from start to finish. “WORLD WAR Z” – A serious action film that’s one heck of a good time.